^ Weidenschilling S.J.,. Dust to planetesimals - Settling and coagulation in the solar nebula. Icarus. 1980, 44: 172–189. ^ Meakin P.; Donn B.,. Aerodynamic properties of fractal grains - Implications for the primordial solar nebula. Astrophysical Journal, Part 2 - Letters. 1988, 329: L39–L41. ^ Takeuchi T.; Clarke C. J.; Lin D. N. C.,. The Differential Lifetimes of Protostellar Gas and Dust Disks. The Astrophysical Journal. 2005, 627: 286–292. ^ Goldreich P.; Ward W.R.,. The Formation of Planetesimals. Astrophysical Journal. 1973, 183: 1051–1062. ^ Lissauer J. J.,. 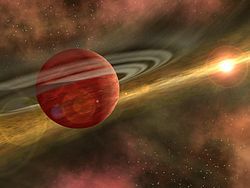 Planet formation. Annual review of astronomy and astrophysics. 1993, 31: 129–174. ^ Wetherill G. W.; Stewart G. R.,. Accumulation of a swarm of small planetesimals. Icarus. 1989, 77: 330. ^ Ohtsuki K.; Ida S.,. Runaway planetary growth with collision rate in the solar gravitational field. Icarus. 1990, 85: 499–511. ^ 10.0 10.1 Kokubo E.; Ida S.,. 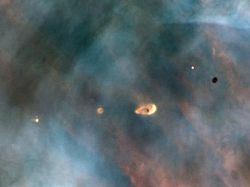 Formation of Protoplanets from Planetesimals in the Solar Nebula. Icarus. 2000, 143: 15–27. ^ Lissauer J. J.,. Timescales for planetary accretion and the structure of the protoplanetary disk. Icarus. 1987, 69: 249–265. ^ Fogg M. J.; Nelson R. P.,. Oligarchic and giant impact growth of terrestrial planets in the presence of gas giant planet migration. Astronomy & Astrophysics. 2005, 441: 791–806. ^ Weidenschilling S. J.; Spaute D.; Davis D. R.; Marzari F.; Ohtsuki K.,. Accretional Evolution of a Planetesimal Swarm. Icarus. 1997, 128: 429–455.